Dissolves cured epoxy and polyester resins so you can quickly and easily separate misaligned materials, or clean cured resins from metal, stone, glass, wood and many other materials. 8 fl. oz. Attack Glue Dissolver. 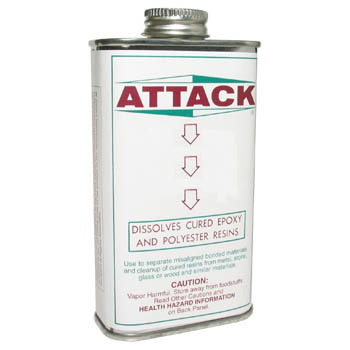 Dissolves cured epoxy and polyester resins so you can quickly and easily separate misaligned materials, or clean cured resins from metal, stone, glass, wood and many other materials.